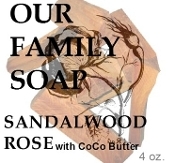 Sandalwood Rose Coco Butter Soap. Our basic soap with the soft warm sensual combination of Sandalwood and Rose essential oils. A classic scent that pleases all your senses. Coco butter adds extra softness to your skin. Olive oil, coconut oil, palm oil, lye (sodium hydroxide, necessary for soap making), sandalwood rose proprietary blend of essential oils, coco butter and vitamin E.